Since Amara is spending the night with her other Grandma I’m going to take advantage of the opportunity to post another “Previously on Amara”. I hope you enjoy it. Amara has always been pretty good about sharing her things but then so have the cats. They all claim ownership of the backyard. 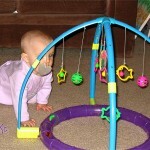 And when Amara was young she was sure some of the cat toys were really hers! I think the cats are under the impression that since they are here all of the time that they get first claim to everything. Twiggy and Twursula have both taken turns sleeping in Amara’s room. They would often sleep on or under her bed when she wasn’t here. When Amara was about two Twiggy went through a phase of sleeping at the foot of her bed when she was here, kind of protecting her. Amara really didn’t like it, she thought Twiggy kept her awake. But at some point the cats decided between themselves that if Amara wasn’t here – it’s Twursula’s room. Still is. For about the last month Twursula has taken to napping next to Amara’s toy box, but she is always in there somewhere. But for the longest time Twursula slept right in the middle of Amara’s bed. If she wasn’t outside she was on Amara’s bed. And Twiggy could always be found in the middle of our bed. Amara and I used to joke when I would go over there. She must have been about 4. She had been over playing and had left her pink princesses sleeping bag laid out in the middle of the floor in her room. And there was Twursula. Sleeping. “Do you know where Twiggy was sleeping? “Do you know where Twursula was sleeping? Sure Amara, you left in there on purpose! The kid sure can think fast! 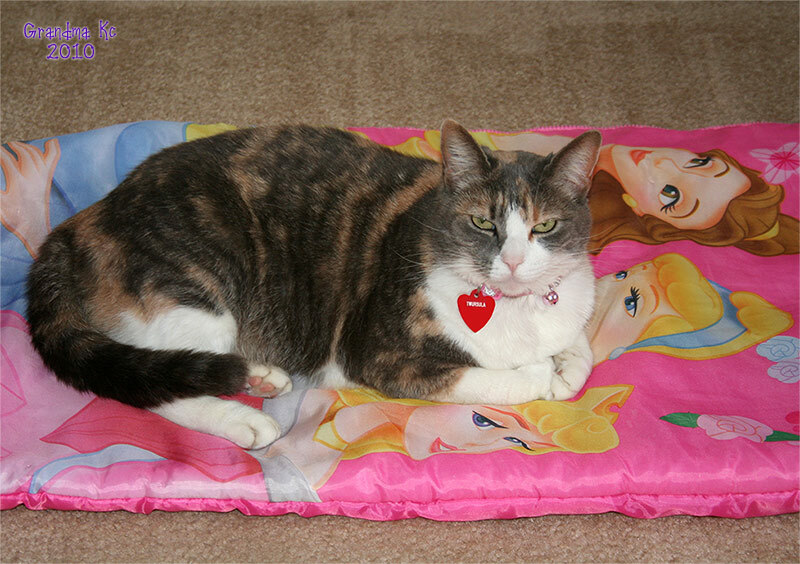 This memory was posted in Previously on Amara and tagged cat toys, cats, Princesses, sleeping bag on May 1, 2010 by Grandma Kc. I hope Amara does love it — like you I would love to have one from either of my Grandma’s. I bet they would have lots of stories to tell me. Now if Grandpa pulled that here Amara would come back with “Grandpa! You’re doing that thing again!” Silly Grandpas! Amara has this thing about building rooms in their imaginary attic – much like the hypothetical Barbies that “might be” found in our attic if we “just look”. So I was telling her awhile ago she needed to build herself a design studio in their attic and she said she would work on it. I asked her last night if she had made any progress and she said she had. I asked her if she had done any work on the spare bedroom attic she was working on for grandma and she’s like “Of Course” – with tone – not missing a beat. Oh we don’t really even know what Brave New World means yet – Amara hasn’t decided. I love it when kids are so quick to retort. Beautiful kitties! I would let them sleep on my bed. 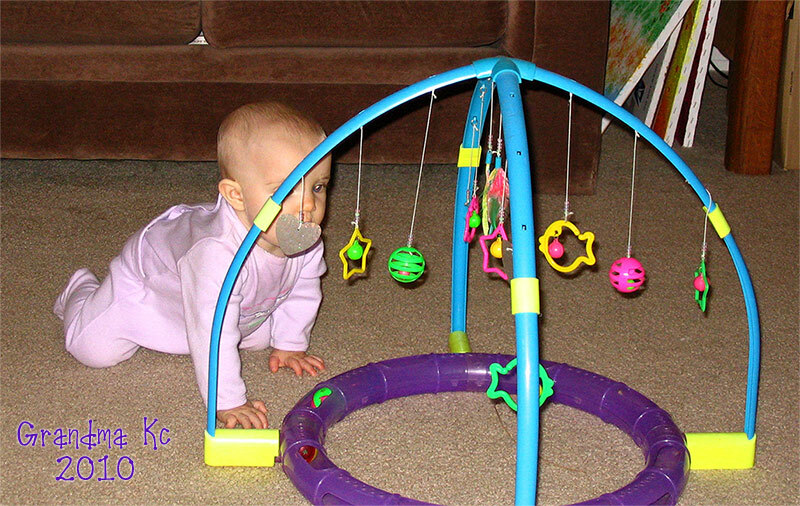 What fun you have with your beautiful granddaughter. Cats are such fun to have around. One day Amara will have such fun reading what you have written about her. Thanks for sharing her with all of us. Ha! That was indeed some pretty quick thinking. Surprised my own daughter didn’t use that excuse about all the clothes she left on her bedroom floor that her cat would cozy up in all those years ago. A fast thinker indeed! She will do well in life 🙂 Thanks for linking with me.